With the opening night of Vivid Sydney 2017 fast approaching, AccorHotels’ Sydney properties are geared up ready to shine from the 26 May – 17 June. Hotels will offer festival goers a taste of their innovative food and beverage concepts, proving their venues are anything but a typical hotel restaurant. Guests heading to Q Dining will enjoy a delicious Vivid inspired menu overlooking Sydney Harbour covered in a kaleidoscope of colours. Not to exclude little ones from the experience, Executive Chef Stefan Brademann, has created a Vivid kids menu, making Q Dining a venue the whole family can enjoy. Q Dining’s Vivid menu is available nightly from 5-7pm or 7:30-9:30pm. Sydney’s cool Cuban bar, Hacienda Sydney, is the place to be and the place to be seen over Vivid. Serving up signature Vivid cocktails Isla de Ligero (Spanish for Island Light) and Arco Iris (Spanish for Rainbow) for $20 a pop, festival goers can sip on the colourful concoctions while sharing a selection of Cuban inspired dishes and take in the panoramic harbour and city views. Open from 12pm til late. First in best dressed policy applies. The Ternary’s signature Vivid menu designed by Executive Chef Anthony Flowers, features teriyaki prawn skewers, roasted lamb rump and his famous Ternary eton mess as an end finale. Settle-in and enjoy two or three-courses plus a glass of wine or 150 lashes pale ale overlooking the Darling Harbour lights. The family-friendly venue also caters for little ones with a $16* kids meal which includes a main dish, unlimited soft drink or juice and a glow pack to help guide them through the Vivid trail. A favourite amongst guests, The Ternary will once again mix up their signature 100s and 1000s Vivid cocktail to enjoy for $16*. The two-course ($55*) and three-course ($65*) Vivid menu is available Monday – Friday, 6:00pm-9:00pm. Embracing Sydney’s iconic festival of lights, Soiree Bar will entertain guests with their own in-house light display as they sip on Belvedere based Vivid cocktails and complimentary canapés, served nightly from 6-8pm. In the heart of The Rocks, Scarlet Restaurant is serving up a $25* prix menu that will wine and dine guests before lights on. Guests can enjoy one of four delicious dishes, including beef ragu pappardelle and signature club burger, plus a glass of wine for only $25 per person. Those already on the Vivid trail needing a sugar hit can pick up an authentic French crepe from Creperie Suzette. Pop into Windows on the Park Restaurant from 6-7pm and take advantage of the two-course early bird dinner from $39* per person including a glass of wine. Kick things up a notch with a Vivid inspired Pineapple Sunset cocktail served from 3pm at Bar Rendezvous. 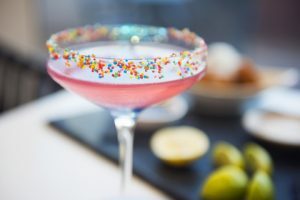 The $18* concoction includes vodka, pineapple juice, raspberry grenadine, a splash of sparkling water and topped with Maraschino cherries, to replicate the festival colours. To book visit www.pullmansydneyhydepark.com.au or call (02) 9361 8400.